We’d love your help. Let us know what’s wrong with this preview of Blues Bones by Rick Starkey. Armed with the stolen finger bones of a dead blues guitar player and a mishmash of voodoo spells from the Internet, he and his best friend enter a graveyard at midnight to perform their ritual. Now, all that stands in his way of winning a local guitar competition is the power of RETURN – a Thirteen-year-old Rodney Becker has found the perfect cure for stage fright. Voodoo! To ask other readers questions about Blues Bones, please sign up. When will the book be out to read, can't wait my Grandson wants one.? Rick Starkey The expected publication date is set for March. It's getting close. We will get to see the cover next month. Feb. 8th! If Rodney has any hope of winning the music competition only a mont A great book for middle-graders! Rodney Becker, guitar hopeful, ca This was an interesting read. The story starts off with great energy, the pace, and true-to-life characters. I loved the premise. Rodney Becker, guitar hopeful, can play, he just becomes nervous on stage. So nervous he shuts down. With the contest one month away, he has time to get his act together. Rodney has the grand idea that he can use a good luck charm or some kind of magic spell to help him get over his stage fright. He and his buddy Max locate the ultimate good luck charm. But after the boys acquire this charm—by stealing it, things go wrong, terribly wrong. I don't want to give anything away! As a years-long student of guitar myself, I found much to enjoy in BLUES BONES. The reader experiences time in a recording studio, and from my experience, the technical aspects were woven into the narrative quite well. You’ll learn a few things about the recording music, and maybe a couple things about playing guitar. The main character, Rodney, suffers from stage fright, but with a big audition coming up he has to find a way to make it through a performance without freezing up. So many kids suffer from one kind of stage fright to another whether it's raising their hand in class, giving a speech, or trying out for something they really want. Author, Rick Starkey, makes the reader feel the desperation Rodney is going through, and then takes us on a journey that just might be Rodney's only way out. The twists an The main character, Rodney, suffers from stage fright, but with a big audition coming up he has to find a way to make it through a performance without freezing up. So many kids suffer from one kind of stage fright to another whether it's raising their hand in class, giving a speech, or trying out for something they really want. Author, Rick Starkey, makes the reader feel the desperation Rodney is going through, and then takes us on a journey that just might be Rodney's only way out. 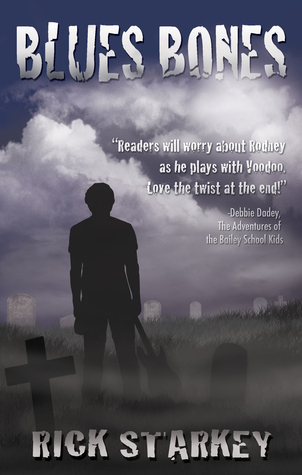 The twists and turns are entwined with a love of music that denotes not only Rodney's expertise but also the author's. And, the fact that Rodney has a supportive, but often weird friend makes the plot move quickly. Blues Bones by Rick Starkey is an exciting teen book about a boy the is a guitar player with talent but has stage fright. He is desperate to find a way to cure this and is led to an extreme measure. Carrying around a stolen finger bone of a dead guitar player is the plan! See how it works in this action packed, fun, and crazy novel. Enjoyed it completely. Great plot, well developed characters, and lots of unique ideas. Never boring. I received this book from NetGalley for a honest review. Blues Bones was such a fun read. What kid--young or old--can resist a voodoo spell in a graveyard at midnight?! Once Rodney dabbles in the black arts, things go from bad to worse. I loved following along, rooting for Rodney as he figured out how to fix things...or how to come to terms with what couldn't be fixed. Great for magic lovers, music lovers, and middle grade readers alike. enjoyed it so much I didn't want to stop. Couldn't wait to see what was going to happen to Rodney next. Rick Starkey is a graduate of the Institute of Children’s Literature, and a current member of the S.C.B.W.I. His main interest is writing novels for middle grade. Rick has sold short pieces to Highlights for Children including a game, magic tricks, and a short story. Rick lives in a 200-year-old log cabin in the Great Smoky Arts and Crafts Community in Gatlinburg, Tennessee, where he and his wife, Rick Starkey is a graduate of the Institute of Children’s Literature, and a current member of the S.C.B.W.I. His main interest is writing novels for middle grade. Rick has sold short pieces to Highlights for Children including a game, magic tricks, and a short story.